Meditating on the lotus feet of Sri Sri Radha-Muralimanohara, placing myself at the dust of Lord Caitanya’s feet, and respectfully offering obeisances to the great devotees of the Lord, who are so many oceans of transcendental virtue, I shall now happily begin to praise the transcendental opulences of Sri Vṛndāvana. 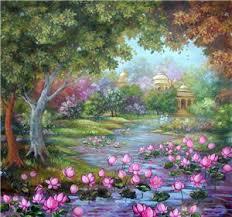 I am not strong enough to go to the far shore of the great nectar ocean of Vrindavan’s glories. Who can go there? 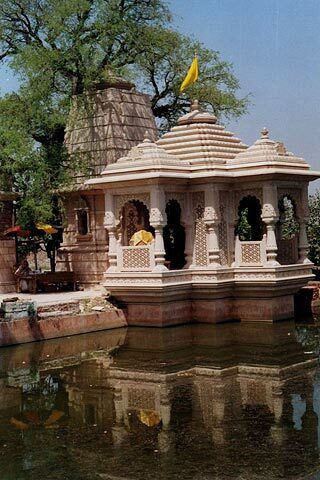 However, because I love Vrindavan. I will now dip into that ocean. I pray that this endeavor may become successful and bring an auspicious result. O Sri Vṛndāvana , please reveal in my heart Your wonderful transcendental form full of the most confidential spiritual knowledge and bliss. Embarrassed to describe the highest nectar, the Upanisads only say “not this, not this”. Where are you described? Day and night I glorify Vṛndāvana , which is filled with the wonder of Sri Sri Radha and Krsna’s pastimes, the wonder of the greatest sweetness, the ultimate nectar of Lord Hari, the sweetest, most beautiful auspiciousness and a flood of virtues Ananta-sesa, Siva, and a host of others cannot cross. Think of Vṛndāvana with love. Roll in its dust. Love it ardently. Please its moving and non moving residents. Worship Sri Radha’s birthplace. With all your heart take shelter of Sri Vṛndāvana , the best of all holy places. I meditate on Vṛndāvana , where the cuckoos sing the fifth note, the flute plays splendid melodies, peacocks sing and dance, vines and trees bloom, splendid and charming forests are wonderful with many birds and deer, and there are many splendid lakes, streams and hills. May my eyes become overwhelmed with ecstasy by seeing the nectar waves of Vṛndāvana’s beauty. May my intelligence drown in the nectar ocean of Vṛndāvana’s glories. May my body become agitated by the swiftly moving currents of ecstatic bliss and thus roll about on the ground of Vrindavan . Falling down like a stick, may I offer my respectful obeisances to all the residents of Vrindavan . May the land of Srila Vṛndāvana where Subala and the other wonderful cowherd boys, who are all dear friends of Sri Krsna, play, where Lalita and the other splendidly beautiful young gopis, who are all filled with love for Srimati Radharani, enjoy transcendental bliss, and where Sri Sri Radha-Krsna thirst to enjoy wonderful transcendental amorous pastimes day and night, become manifest in my heart. To drink: the freely flowing streams are filled with clear sweet water as nectar. To eat: the dried leaves from the trees are foods as palatable as one could desire. The warm breezes are just as one would have them. To reside: there are clean mountain caves and other suitable residences. Alas! Alas! How unfortunate I would be if I wished to leave Vṛndāvana ! May Sri Vṛndāvana , which grants auspiciousness and bliss to all, and which is deeply loved by two or three great souls, become the mother and protectress of blind me. May I love Vṛndāvana , where at the base of a kadamba tree on the cool shore of the Yamuna a dark complexioned, amorous, divine youth dressed in yellow garments plays a flute as He glances at Radha’s lotus face. He who gives up the company of ordinary people, keeps no servants or followers, agitated with a desire to serve Sri Sri Radha-Krsna, constantly sheds tears, his hands placed on his cheeks and lives in Vṛndāvana , is the most fortunate of all persons. 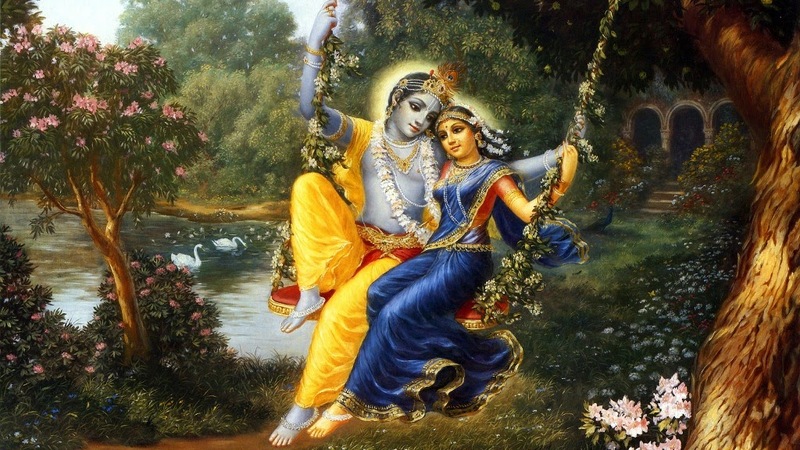 Where do all people automatically and effortlessly obtain pure ecstatic love for Krsna? Where does the Supreme Personality of Godhead manifest His supremely wonderful pastime form? 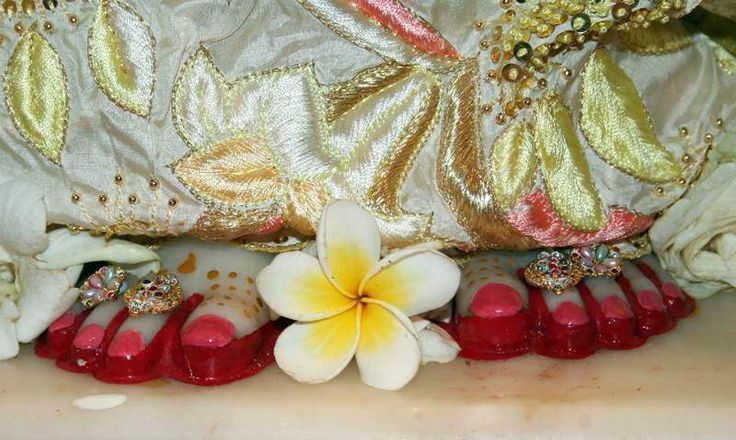 Where is the empire of the bliss of devotional service to Krsna’s lotus feet manifest? O brother, listen I will tell you a secret. All this is present here in Vṛndāvana. In Vṛndāvana forest the trees are called druma because they melt [dru] with love for Krsna and they are also called taru because they shield [tarana] Krsna from the blazing sunshine [tarana]. 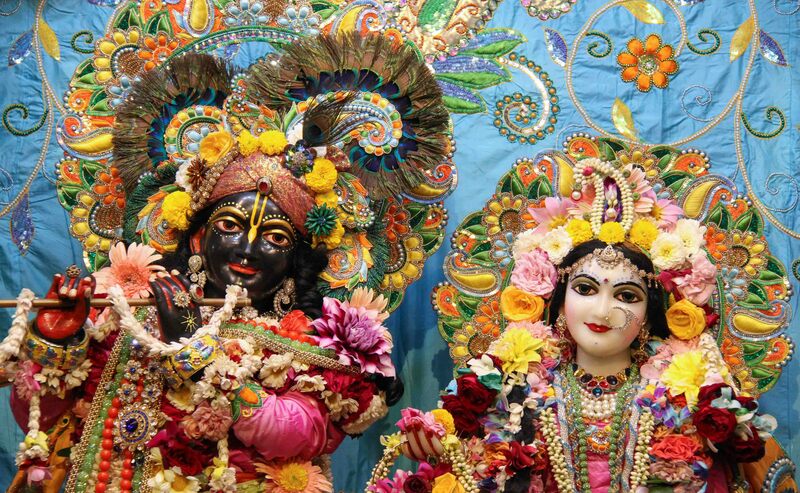 The vines are called vratati because they have taken a firm vow [vrata] to serve Krsna. 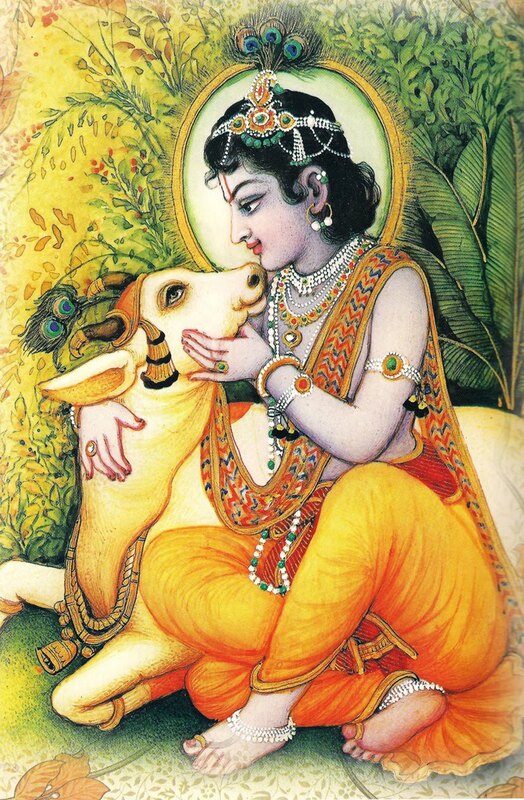 The deer are called krsnasara because Krsna is their life and soul [sara], and they are also called mrga because they always search [mrg] for Krsna’s footprints. Anointing your entire body with the dust from the feet of the residents of Sri Vṛndāvana , seeing Sri Vṛndāvana as the supreme effulgent transcendental realm, and meditating on the fact that Sri Sri Radha and Krsna are always charmed by the sweetness of Sri Vṛndāvana , please reside in this transcendental abode, Sridhama Vṛndāvana. Last weekend, in Vrindavan, I stayed with the family of Deepak Handa prabhuji. Prabhuji is a very sincere, steady and soft-hearted devotee, it is indeed a good fortune to be able to get association of such a Vaishnava family. We started our journey back to Gurgaon and as we were crossing Parikrama marg we saw a western mataji collapsing in front of us on the sidewalk. They were two matajis, in their mid thirties, one of them collapsed and a small crowd had gathered. Deepak prabhuji immediately stopped his car to check if everything was fine. Rather reluctantly, I too followed prabhuji, thinking what help can we give as we are on way back to Gurgaon. As we reached the spot we found that one local devotee had already stopped a rickshaw and was requesting them to show them to a nearby doctor whom he knew personally. Another local mataji too checked and as she found that the mataji who had collapsed was back on her feet and someone is taking her to a doctor, she was satisfied and left. I too told Prabhuji let’s leave as everything seems settled, she just seemed weak and may be collapsed from exhaustion or weakness. The only hitch in my mind was to which doctor they were being taken to. I told the local devotee to take them to ISKCON hospital but he was firm to show them to the doctor he knew very well, he insisted that many local devotees see this doctor only. All seemed settled but Deepak prabhuji refused to leave them like this. He said if we are slightly doubtful then let’s check the doctor. We were getting delayed and I thought by going to the doctor we will get further late and we should just move on. Of course I didn’t say it as Prabhuji seemed firm on helping them. Prabhuji went to park his car properly and I followed the two matajis to the doctor, along with the local devotee who recommended him, the doctor was very close by. The doctor turned out to an ayuvedic doctor/practitioner. He checked her blood pressure, pulse, etc and said that she is suffering from severe acidity, may be even diarrhea, and that she has lost too much fluid. He then scolded the devotee who brought her stating that he let this mataji lie down on his couch as she seemed to have passed urine, even stool, in her clothes. Suddenly I could smell the stench and felt repulsed. The doctor, said that he can’t do much instantaneously and the best course is that she drinks some energy drink (ORS) and take some precaution in eating. By this time Deepak Prabhuji had walked inside and started talking to the other mataji. We found that they have a flight the same evening to Norway! She didn’t seem to be in a condition to take a long flight today. We also found that they were staying quite close and finally it was agreed to let them go back to their room, get some rest, drink the ORS and then they can decide whatever action they wish to take. All settled. Deepak Prabhuji then took the prescription for the ORS and requested the two matajis go back to their room and that we will deliver the ORS to their room or at their reception. I thought that one of the mataji is fine and she can easily pick up the ORS from a nearby chemist on their way back to their room. Still out of courtesy I told Prabhuji let me go and get the energy drinks. 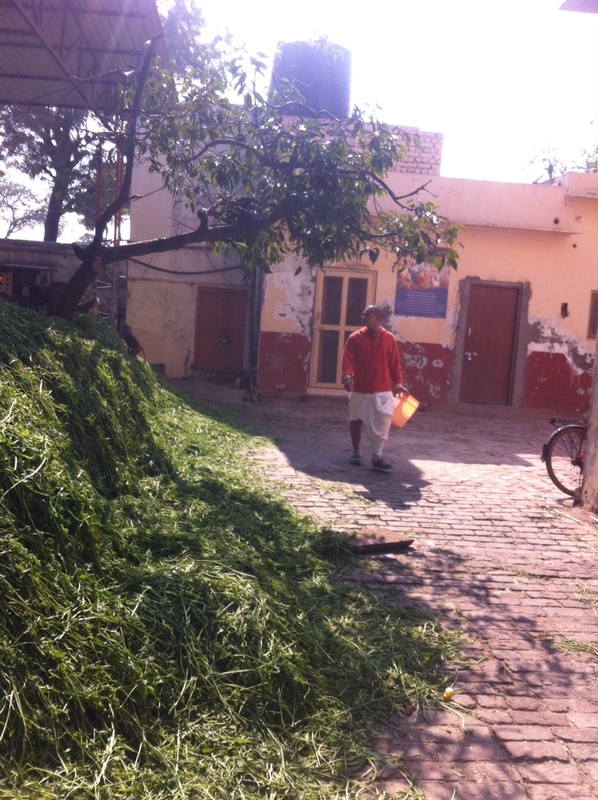 As I came out I saw the rickshaw puller washing his seat as he too realised that it was smelling of urine. He didn’t complain as both the matajis again climbed back in the same rickshaw and left. The only thing in my mind was to quickly leave back for Gurgaon. As I turned back, and slowly walked towards the main road to find a chemist, I suddenly realised that this morning only I had prayed to one of the trees in MVT to kindly give me an opportunity to serve Dhama or some person in Dhama! 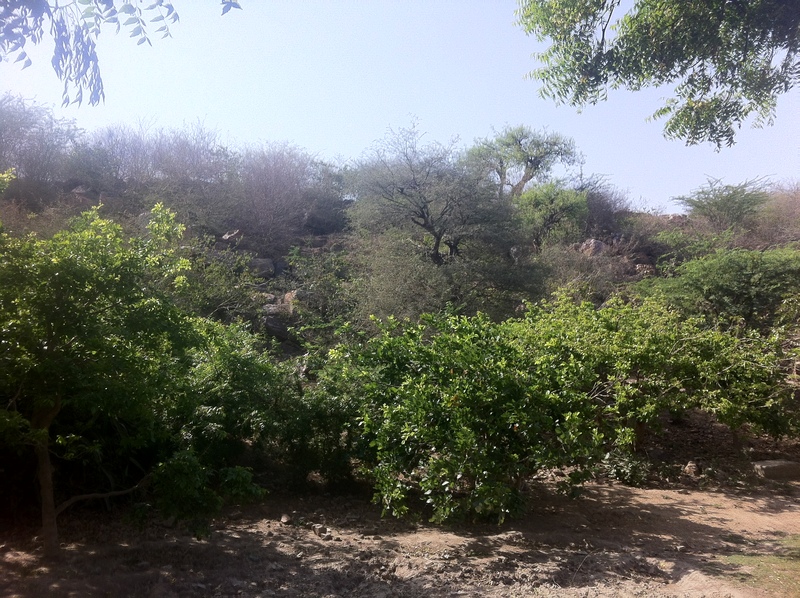 Over the last few months it has become a habit for me to pray to the trees in Vrindavan, with amazing results. I had written about it in an early blog few months back (please read it here). I immediately felt utterly ashamed at my internal thought process during this whole incident. I realised that based on my prayer I received an opportunity to help someone in dhama yet I behaved internally like an insensitive moron. I was also relived that I was with Deepak Handa Prabhuji as I am sure that had I been alone I may not have even stopped or stopped and just moved on. 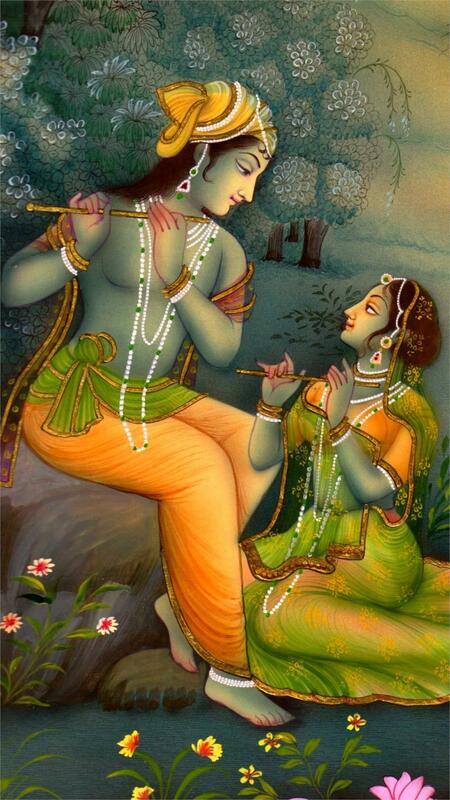 But Krishna is so merciful that He ensured that I was with a devotee whose heart was soft. I profusely thanked Krishna and the tree to whom I had prayed in the morning . In a swift change of mood I was full of excitement and there was sudden spring in my step as I absorbed what really had happened and how my desire got fulfilled within few hours and how close I was to miss it! I knew that had it not been for the presence of Deepak Prabhuji I would have certainly missed it. I went and bought those ORS drinks, then we went together and delivered at mataji’s room. It moved something in my heart. I will try to be more sensitive towards helping others, will pray for a softer heart. Remain constantly in the association of devotees, especially in dhama. I also learnt a good lesson from Deepak Prabhuji on what does being a devotee really means. I felt utterly ashamed from inside. What kind of a devotee I am with such a hard heart. This incident also showed me that if we are conscious in Krishna consciousness then we can clearly see that our prayers are being answered but we have become so blind and hard-hearted that we don’t see them. It also helped me realise that when we pray from the level of our present level of advancement then it helps. I had heard it in a lecture few weeks back that whenever we pray for something then we should pray from the our present level and not try to jump to something higher for which we have no qualification. The example that exalted devotee gave was that if someone gifts us a penthouse in a very fancy building but we find that there are no stairs or lifts for it then it is useless for us. Similarly instead of praying for something very high like Krishna Prema or being present in one of the pastimes of Lord etc., it is better and practical to pray for advancement from our current level to the next level. One can not make progress from an artificial platform. Somehow those words stuck a chord in my heart and from that day my prayers changed and it seems to be working. In the end, I am copying translation of three verses from Sri Vraja-riti-cintamani, by Srila Visvanatha Cakravarti Thakura chapter 2, text 21, 22 & 23, glorifying the amazing trees of Vrindavan. From the branches and roots of the trees of Vraja all Brahmas and Shivas emanate. Although the trees of Vraja are as splendid as the sun, they still are wonderful parasols to shade one from the sun’s rays. They shine with the luster of youth, just as the four Kumaras. 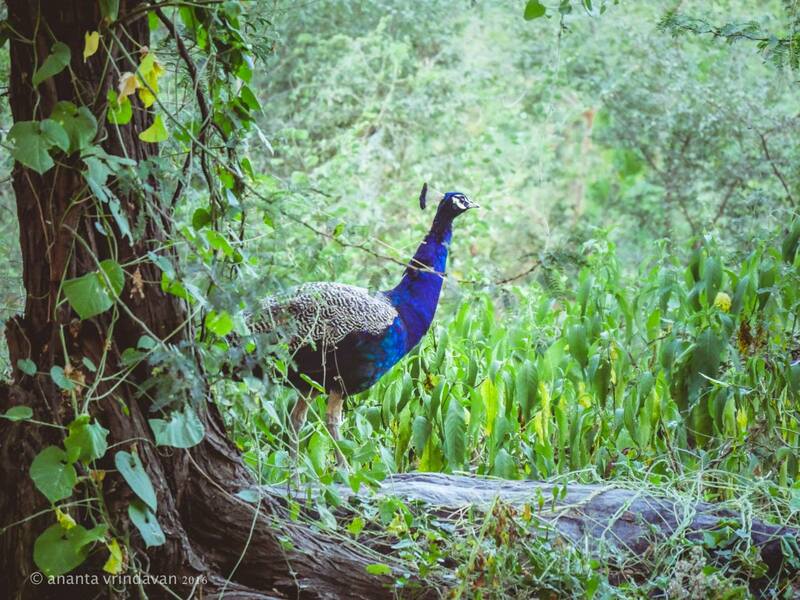 All glories to the trees of Vrindavan. 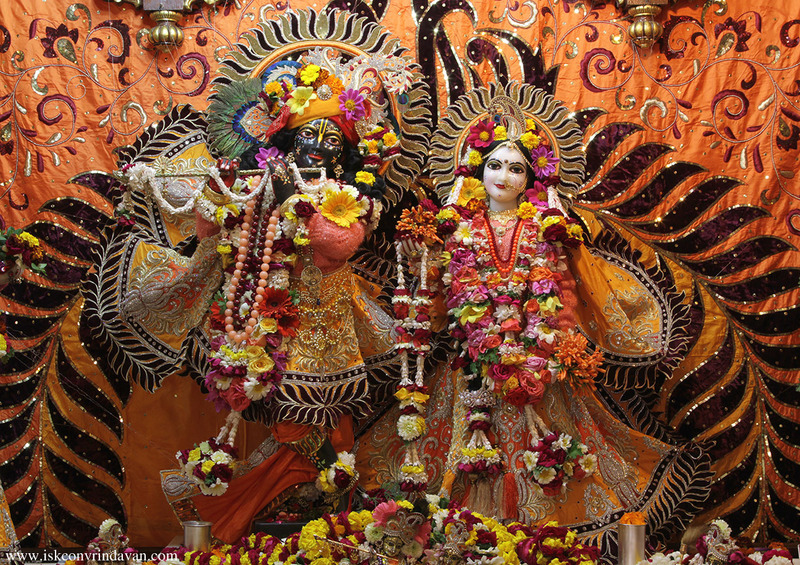 9th February, 2014, Vrindavan Dhama. 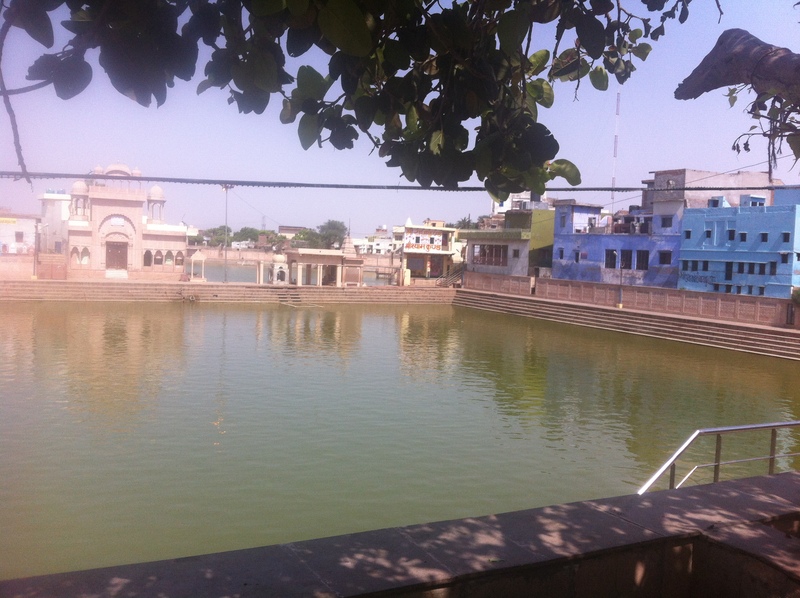 I had not been to Vrindavan Dhama since last Kartika, which is a shame as I live just a 2.5 hour drive away. It was a double bonanza trip for me, first HH Janananada Maharaj was there and he had agreed to give me some time, he is a very simple, austere and humble Sanyasi. 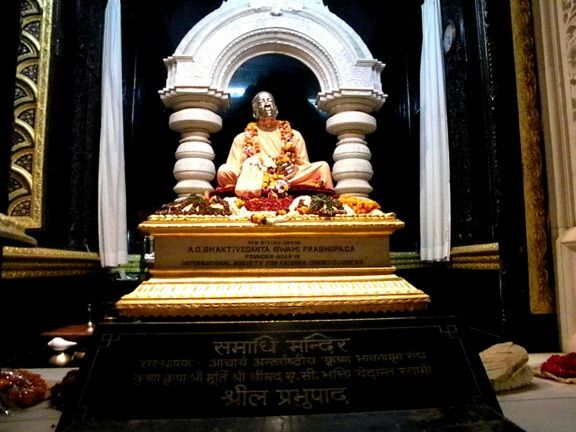 In the words of HH Gopal Krishna Goswami Maharaj he is one of the hidden jewels of ISKCON. 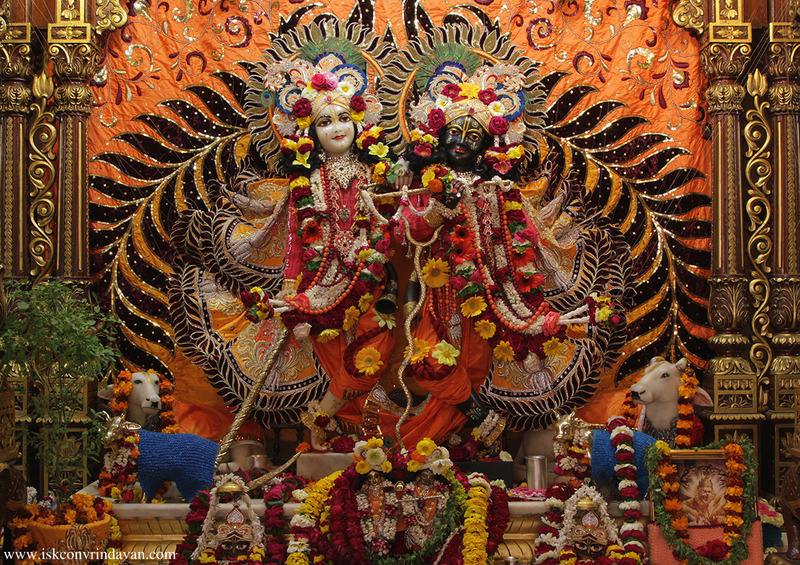 Maharaj always stay at ISKCON Goshala. The second bonanza was that Sumeet prabhu got me a room at the same Goshala. I have no love for cows and I thought staying close to them I might inculcate some love for cows. I left on Saturday noon and reached Goshala around 4 pm. I had planned to change, take darshan of the Deities and then meet Maharaj. As I got down from the car and turned towards the Goshala building I saw HH Janananada Maharaj walking with his assistant. I paid my obeisances, he was pleasantly surprised to see me and said that he is going for a program and might get late so he will see me tomorrow morning. I kept on walking with Maharaj and after some time requested him if I too could attend the program. He agreed to my request, the program was at ISCKON hospice. Maharaj refused to sit in my car and chose to walk stating that it was a short distance and he always prefers to walk. 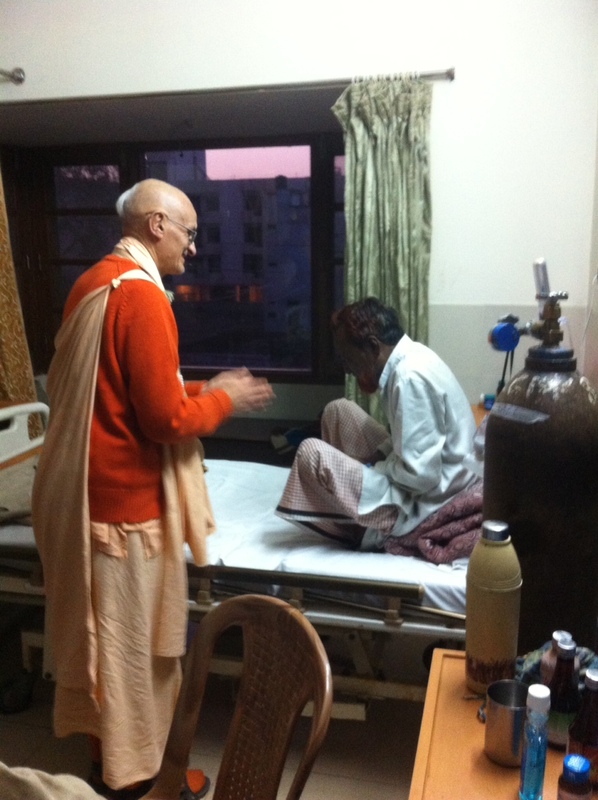 We reached the hospice and the program started Maharaj gave a very nice lecture on SB 1.7.7. 1. Srimad Bhagavatam is the fruit of vedic knowledge, we should be concerned with the fruit rather than getting lost in the vast vedic knowledge. 2. Knowledge is good but what we do with the knowledge is more important. Maharaj gave many examples from Srimad bhagavatam like Hiranyaksha, who had the knowledge about spirit soul but still utilised it for the wrong purpose. 3. False ego means false identity, we are thinking of ourselves at the bodily platform rather than as a spirit soul. Maharaj gave the example that if a person is watching TV along with his dog and is totally immersed in the TV program, laughing, crying, etc. watching it. The dog must wonder why my master is behaving in such an odd way. The dog is not connected with the TV and will wonder if his master has gone crazy! Maharaj said similarly in today’s time we identify with our wallet and now mobile phone and how badly we lament when we lose our mobile phone as if our life air is lost. 4. Maharaj concluded the session by instructing us that we to see everything in relation with Krishna and not with ourselves. This is what Guru maharaj also always teach us that Krishna should be in the centre and not us. As maharaj was leaving and reached the main gate of the building, he turned back and asked the doctor accompanying us that he wants to see the facilities and meet the patients. We turned back and then Maharaj went through the facilities, there weren’t too many patients, and the building, though simple, was well maintained. Then we went to the top floor and met patients. We were told that they are all cancer patients, at their last stage. Srila Prabhupada’s kirtan was playing in each room and somehow the atmosphere was not that of complete gloom. Maharaj went and met every single patient. 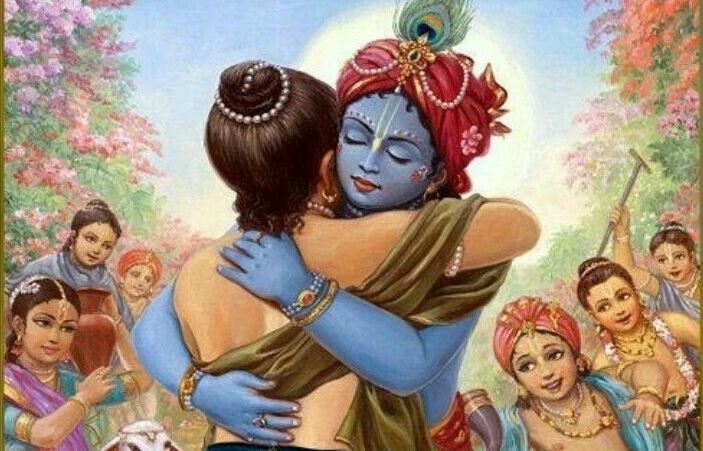 He held their hand, consoled them not to fear and told them to chant the Holy name. Maharaj was full of compassion. We came back to Goshala, I took permission to get fresh and take darshan of the Deities. I checked into my room. It was a very simple room, just a bed and nothing else, the bathroom was neat and simple. 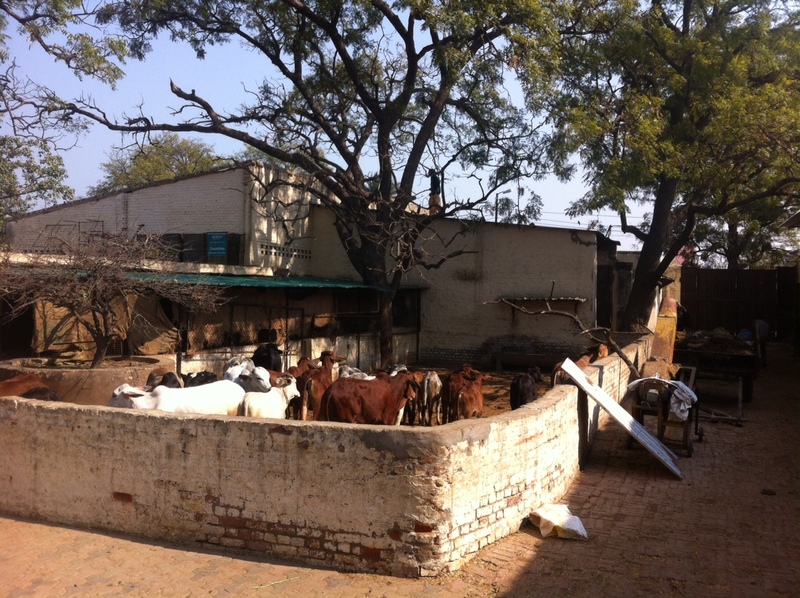 Standing outside the room the air smelled fresh, though scented with cowdung, hay and other paraphernalia. I went to the temple and took darshan of Their Lordships. It is always a very humbling experience standing in from of Krishna & Balram and facing music in the heart that my progress in spiritual journey is negligible and no efforts in preaching. I took darshan and told Them I would try harder and begged for their mercy. I could get Mahaprasad from the counter for dinner. I came back to Goshala. I found the ambiance here very soothing, a pleasant change from all the hustle and bustle around the temple. I felt as if I in a different Vrindavan. To my surprise I found that the geyser in my bathroom is not working and I wondered how to take a cold morning bath but then Maharaj’s assistant came to my rescue and told me that I can get warm water from Maharaj’s bathroom. 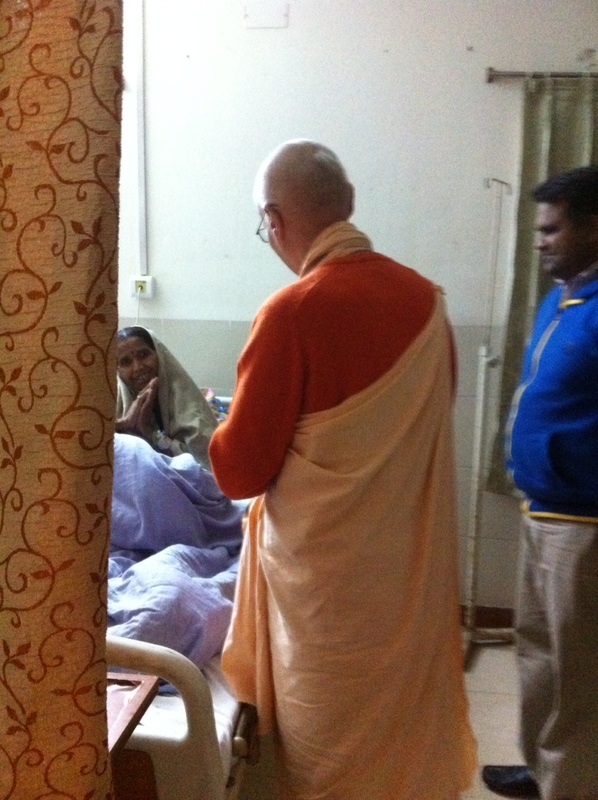 I honoured the Maharaprasadam in the room and was in the bed by 9pm. It was very calm and serene barring some noises from cows and monkeys which I actually liked. I got up without the alarm as at 3 am, I felt as if the whole place has come suddenly alive. 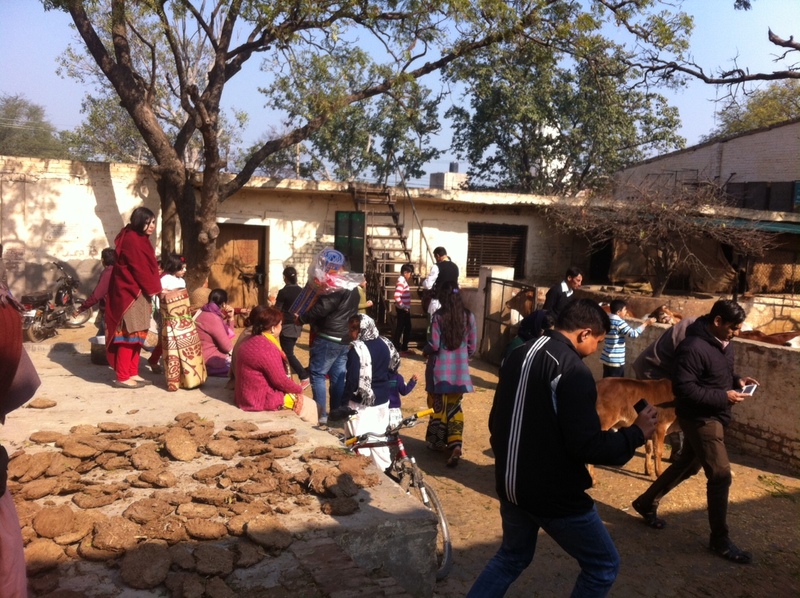 There was some generator or machine which started with great noise and the people were moving around, cows and what not. One Brahmachari was already taking a bath my bathroom, as he came outside I asked him `Is the geyser working?’ He said the water is fine, though not hot it is not very cold also. It gave me courage to enter the washroom and I thought if he could take it then so could I. I opened the tap of the geyser and there was no difference in the temperature and water was so cold! All my thoughts and courage of taking a cold water bath got evaporated immediately and I shamelessly went toward’s Maharaj’s room to get warm water. Maharaj came out and gave me an inquiring look. I explained about the geyser and Maharaj told me to take water from his bathroom. As I came out of room after getting ready, I was not ready for the chill and it is some walk to the main temple from here. As I walked out I saw a Brahmachari starting his scooter. I requested him for a lift till the temple and I was right in time for Prabhupada arti at his samadhi. As I stood there with darkness all around me and just the light from Samadhi illuminating I wondered if this shows that unless I take shelter under the lotus feet of Srila Prabhupada I will remain in darkness. Then it was time for the mangal arti and surprisingly for a Sunday it was not all packed up and I found a good place to stand in front of the altar. The Kirtan peaked at 4.30am and the altar doors opened. 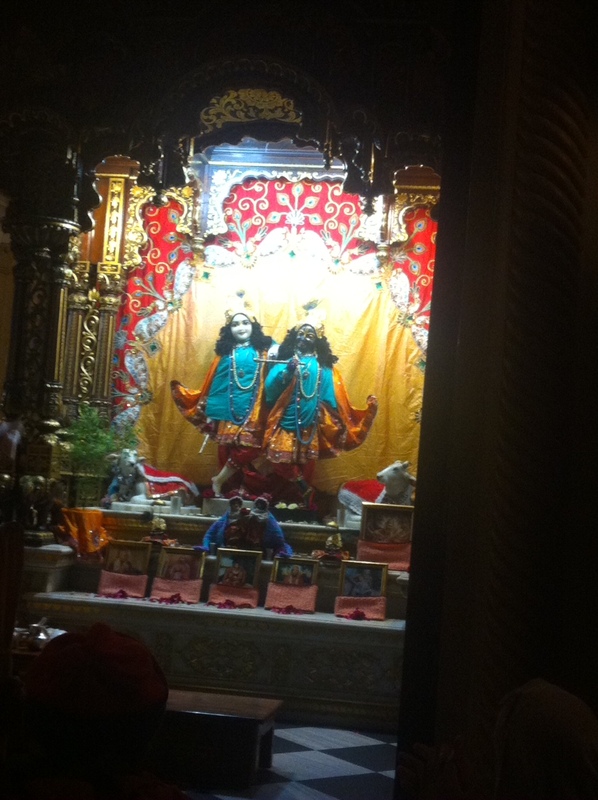 Mangal arti darshan is always very very special and somehow it always reminds me of Krishna Lila. After a melodious arti and then Tulasi pooja, I went to Srila Prabhupada’s quarter to chant my rounds. I felt too cold there and had to take shelter of the guest house reception where I paced from one side to another to keep myself warm. It was then time for the Shringar darshan and Guru Puja. I wonder how the beauty of the Deities at Vrindavan always seemed to increased every time and They always look so fresh as if They have just came out after taking a bath, Nava Yauvana. 1. Looking into the past is in the mode of tamoguna (ignorance), looking into the future is in the mode of rajoguna ( passion) and looking or putting our consciousness into the present is in the mode of Satoguna (goodness). 2. 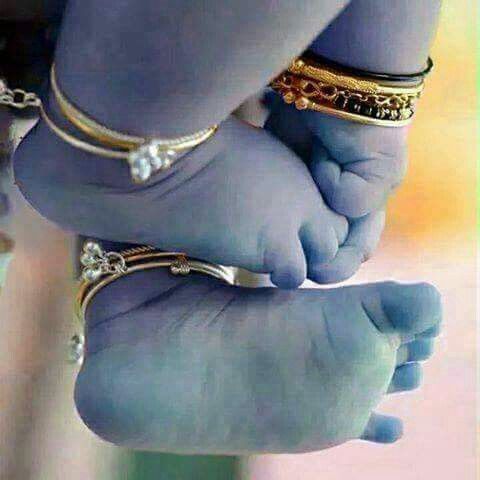 Our philosophy is not so much devotion to Krishna but devotion to Krishna’s devotees. I had a quick breakfast at Govinda’s and then came back to Goshala. There was a group of new devotees who had arrived from Punjabi Bagh temple with two Brahmacharis. All glories to preaching ! I met Maharaj again. He spoke about working on the `internal’ as well `external’. 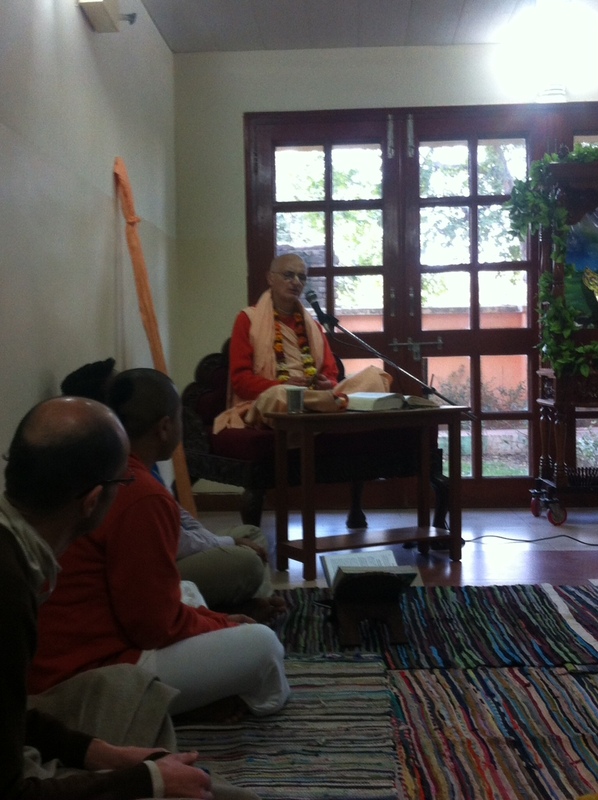 He explained that our internal consciousness is known only to us unless we confide in some devotee. Hence externally devotees may correct us in chanting properly, correct our pronunciation, our dress, etc. but internally we have to work ourselves very consciously as only we know this internal status. Maharaj also advice that`Grahsthas’ must maintain at least a basic standard for Deity worship. He explained very nicely that if one learns all the rules and regulations when learning to drive a car then it may get little cumbersome in the beginning but later it will help a lot when one would drive almost without remembering but still following the rules. He said imagine a driver who learns without any rules and what kind of driver that person will turn out in the future. I left Dhama at noon after taking darshan of Their Lordships. All Glories to Sri Krishna Balram. This was during my initial days of spiritual journey. 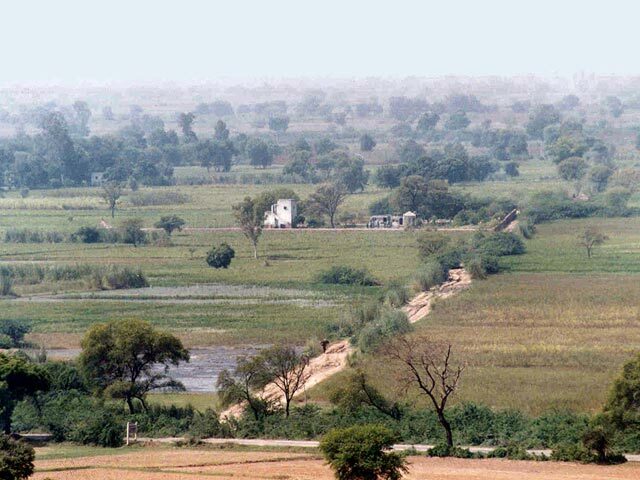 I had started going to Vrindavan, alone, staying for a day or two, not knowing what exactly to do besides attending temple program. I did not know a single soul there besides Deities. So, mostly I would attend all the morning programs, have breakfast prasadam at Govinda, come back to room to read, sleep a bit, back in the temple at 4-5pm, have dinner prasadam at Govinda, come back to room, read a bit and sleep by 9pm for next day’s Mangal Arti. This is what I still aspire for. I was again in Vrindavan Dhama and after Mangal Arti there was announcement that it is very special day (what day isn’t special in Vrindavan) and a bus will be leaving for Vrinda Kunda for the marriage of Tulasi and Shaligram. I had never ever heard in my life about this event and I don’t know why my heart prompted me to board that bus to the Lila sthali of Vrinda Devi. I went for it. It was two bus load of devotees, with hardly any Indian on board. We reached the temple after a long bumpy ride, it was in middle of the fields, with no road after the final turn towards temple. 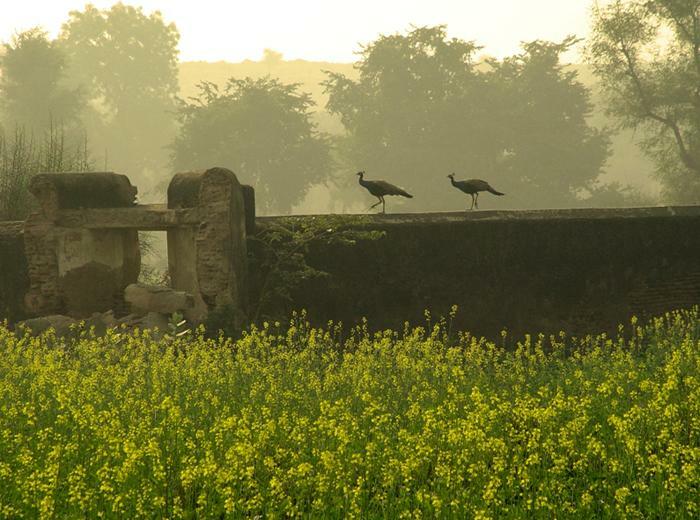 I could see a beautiful small temple decorated in very simple and traditional Indian way. There was a slight buzz around the place. I found that a group of devotees had done all night kirtan the previous night. Jai ! As we entered it was announced that we will get some prasadam, we sat on the mats and were served a very delicious puffed rice prasadam, it was dry and salty, with a banana. I still remember the taste of that prasadam after so many years. I still hanker for it, even that time I had greedily taken extra portions and kept on munching it for a long time. 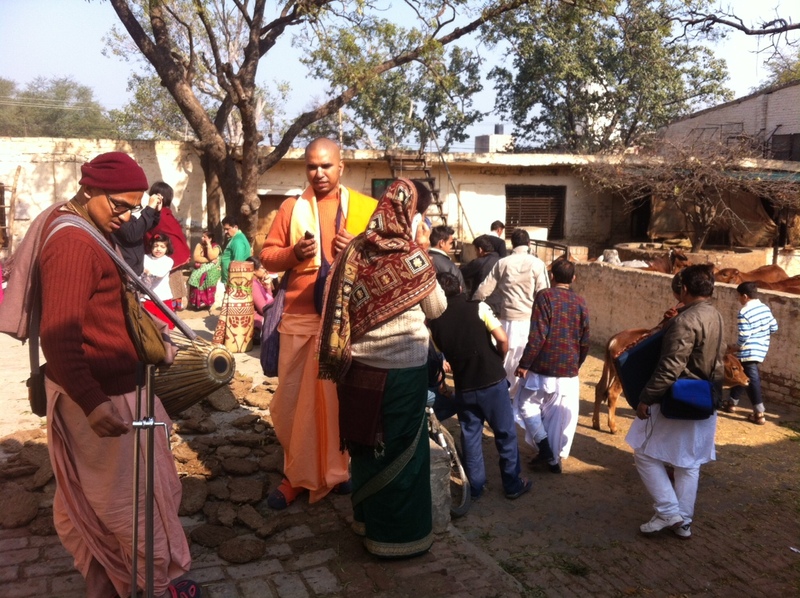 After the prasadam was over most of the devotees got busy with some service. The temple was getting ready for the marriage. The whole setting was completely rural. I wondered around, bought and read a book, a devotee had put the book stall. I was too naive to beg for any service. I was told that an Malaysian couple has been sponsoring this event for some time. As the time came for the marriage we had ISKCON pujaris and local temple priest who presided over the ceremony complete with mantras and, later, pheras. 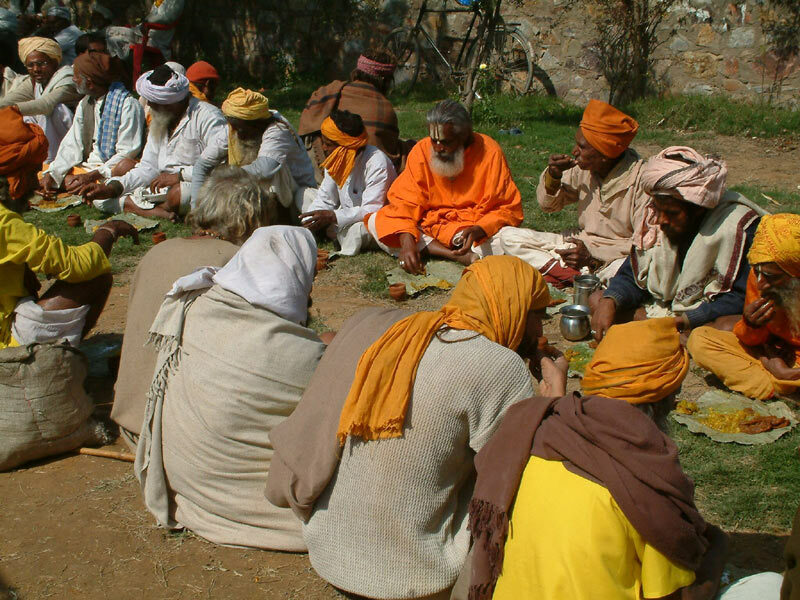 The local priest explained how the `Braja’ scriptures are different from what our Acharayas have written. The Malaysian couple, wife was Indian and husband a native Malaysian, did the kanyadaan. Shaligrama shilla and Tulasi walked around the havan kund in their laps. Many devotees had brought nice gifts for the newly weds. Amid all the kirtan, marriage, vidai (bride leaves for husband’s home) not for a single moment I felt that I was not attending a traditional Indian marriage. After the marriage there was a feast for the local Brajawasis, we served each one of them with sumptuous prasadam. Once they finished then it was our time to honour the prasadam. Kirtan continued almost throughout the time. It was the first time that I came contact with the non-Indian ISKCON devotees and I was completely ashamed to see their devotion during the whole ceremony. I am sure I have never worked so hard, as they did, in any of my cousin sister’s marriages (I don’t have a real sister). I still vividly remember one devotee feeding leftover prasadam to a street dog with such affection as if feeding his own son. I would not have even gone close to that dog in normal times. Consciousness of all these devotees was very pure and I felt being the odd one out. We came back in the evening. I will felt purified till my inner core. Sometimes when I look back, I think it was after attending this ceremony and being in touch with so many pure devotees that my spiritual journey got on the track. I also feel that we do not appreciate enough what role ISKCON plays in making such `Lila sthali’ accessible to a common man. Had it not been for ISKCON, every devotee would be on the mercy of local `panda’ or priest, as in most traditional Indian temples. I don’t remember being charged for this for the trip, and even that would be some very reasonable amount to cover the cost, got association of devotees, blessings of attending Tulasi Shaligram marriage, heard melodious and impromptu kirtans by devotees, sumptuous prasadam, opportunity to serve Brajavasis. I do not know any other organization in India, or the whole world, which would serve so much and that too for a non-member like me and with no other motive than to please Krishna. It is a pity when I see so many temples in India, at prime locations in cities and various Dhams, in dilapidated condition. They should all handover the management to ISKCON and see the difference in service to Deities and preaching in the area, which is the purpose of a temple. 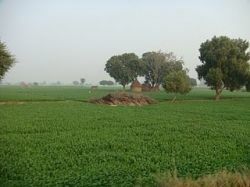 All glories to Tulasi- Shaligrama Vivah. 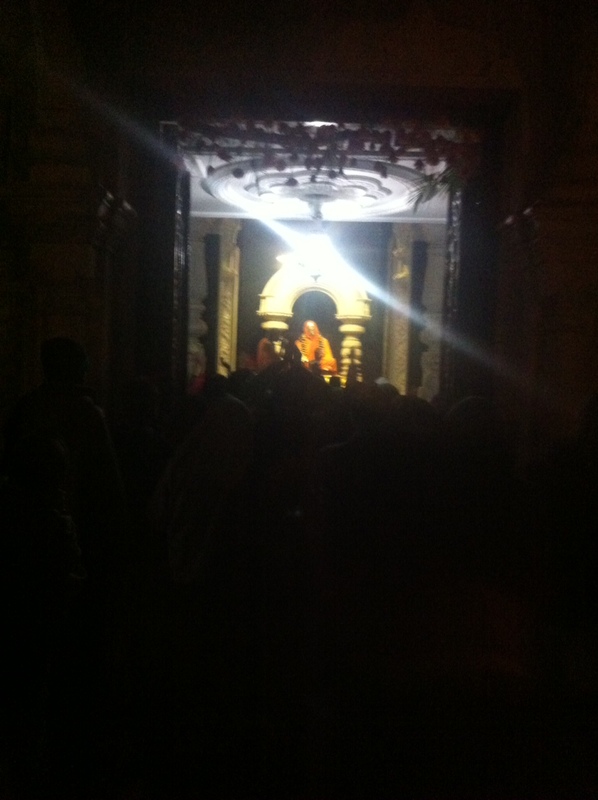 from where Krishna returns back home every evening in Vrindavan Dhama !